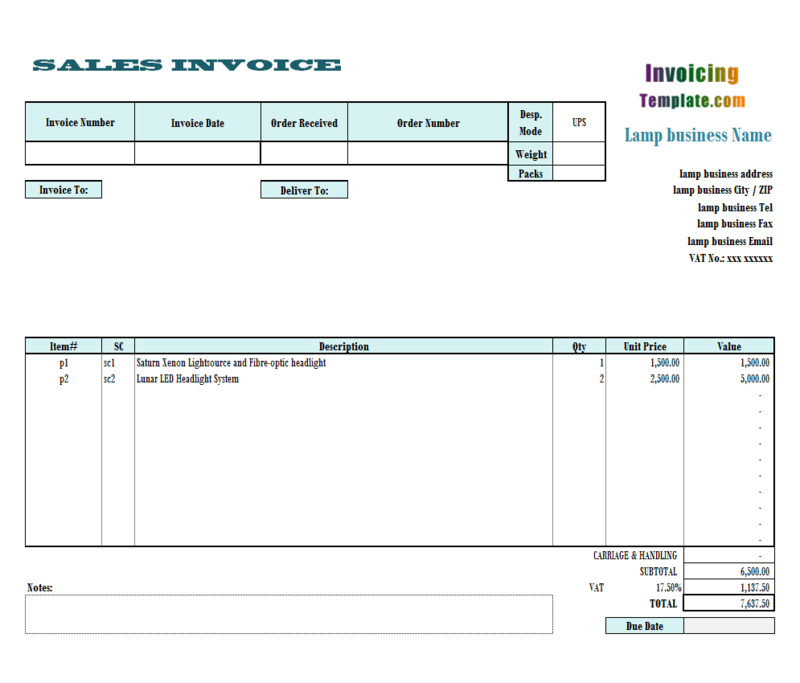 This Netherland Sales Invoicing Sample, like all the other invoicing templates here on InvoicingTemplate.com, was created based on the default template shipped with Invoice Manager for Excel (namely Uniform Invoice Software), but customized for Netherland sales companies. 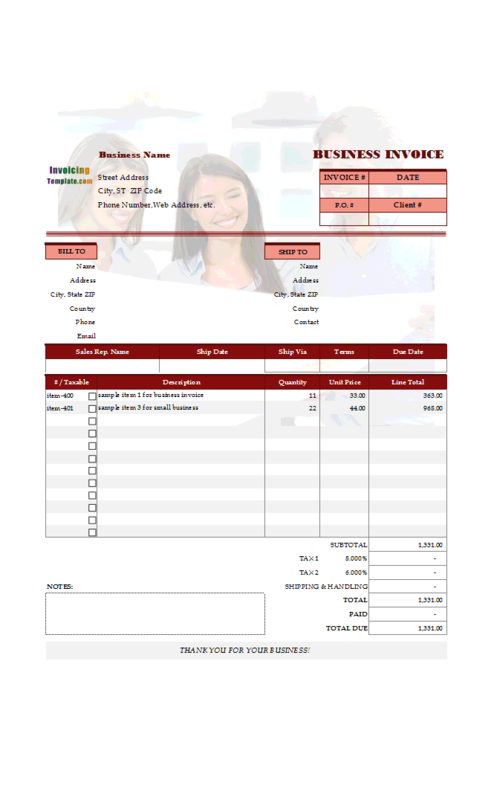 c6009 now includes the customized invoice template for the latest version of Invoice Manager for Excel. This is what you will see when you open netherlandsales.xlsx. 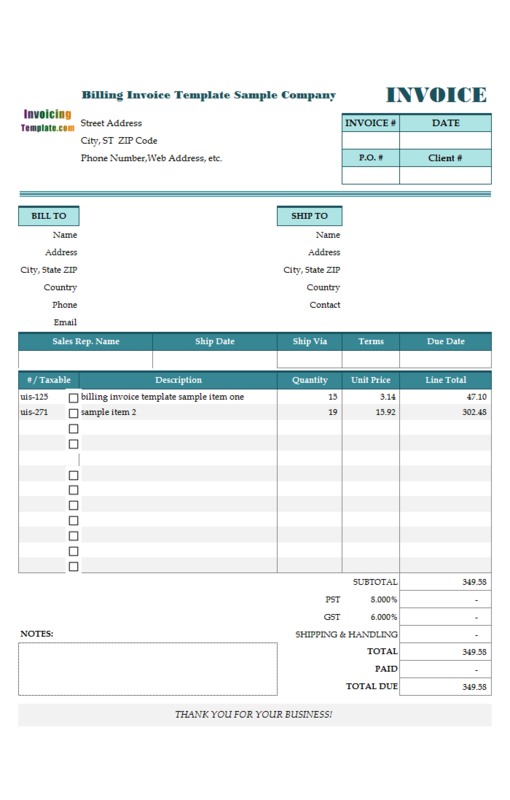 Netherland Sales Invoicing Sample, like all the other invoicing templates here on InvoicingTemplate.com, was created based on the default template shipped with Invoice Manager for Excel (namely Uniform Invoice Software), but customized for Netherland sales companies. The Dutch value added tax (VAT or spelled in the Netherlands as "BTW") is a general consumption tax, which is supposed to be ultimately born by the consumer. The VAT is included in the retail price of basically all goods and services. 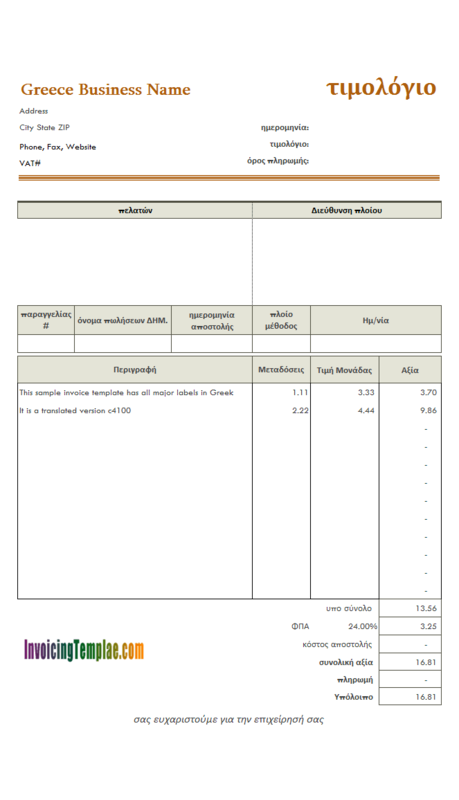 In general, the VAT must be included in the invoice issued by the supplier of goods or services. As a matter of fact, businesses function as the withholding agent for the Dutch tax authorities. 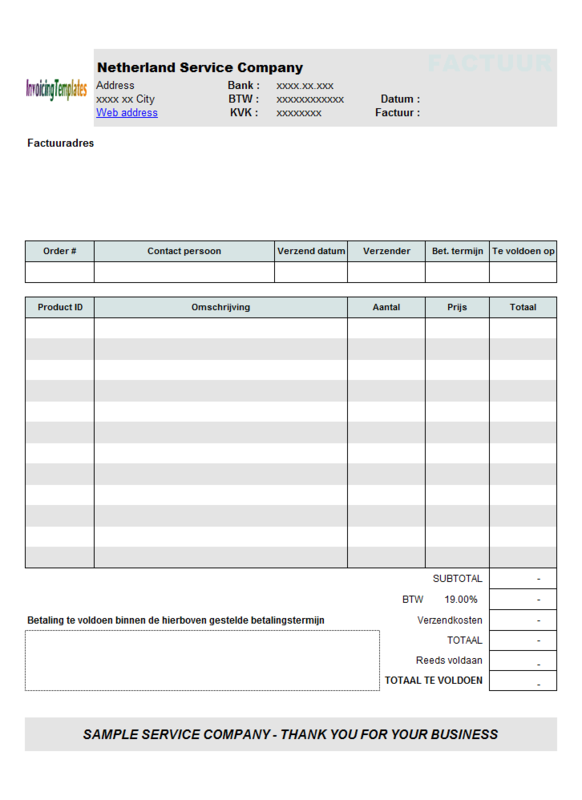 This Netherland sales billing template meets above requirements, and all the labels on this template are translated into Dutch. For example, "Bill To" on the default template is now "Factuuradres", "Ship To" becomes "fleveradres", "VAT" becomes "BTW". 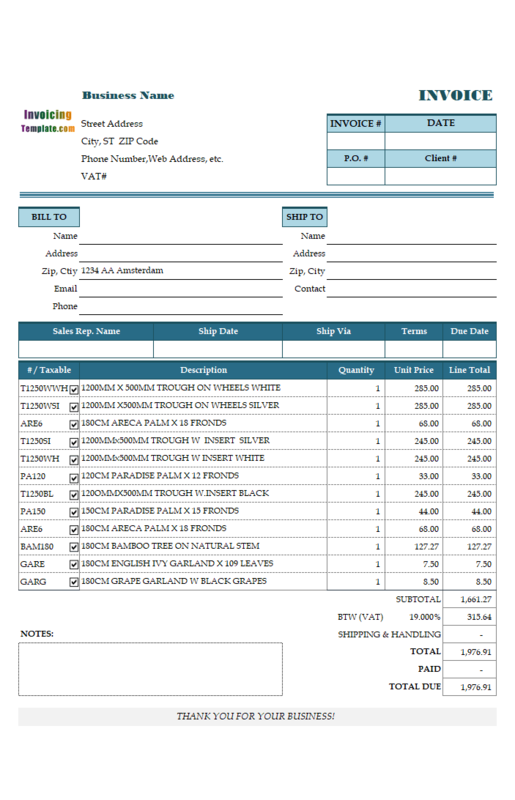 This Netherland Sales Invoicing Sample does not show currency symbols on the invoice form and the printed invoices. If you would like to change or set the currency symbol, here is how to do it. 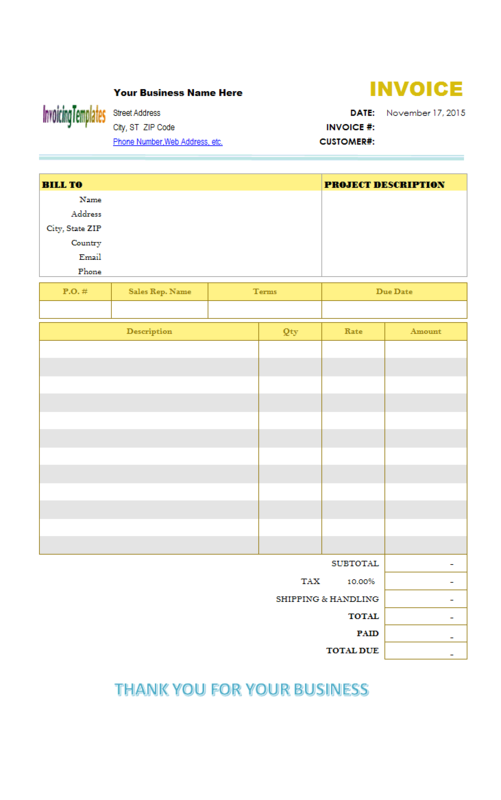 This template was originally published on office-kit.com at Holland Clothing (Wear) Company Invoicing Format and Invoicing Design for Holland Clothing (Wear) Company or Shop. 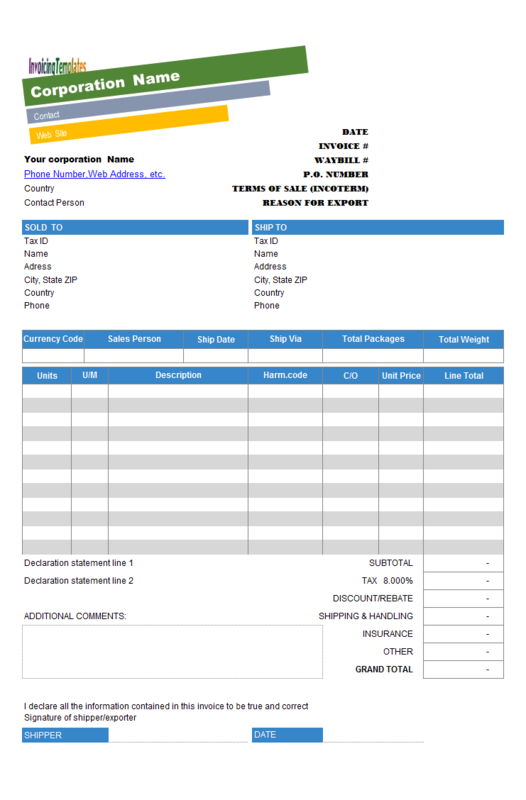 The documents on office-kit.com include further customization information regarding this template, so if you are interested in this template feel free to take a look at those documents. 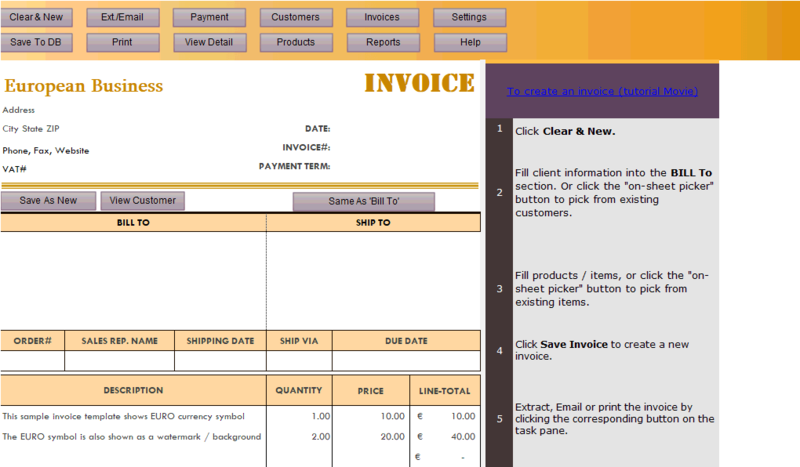 It is also featured on UniformSoft.com, at Invoice Design for Holland Clothing. 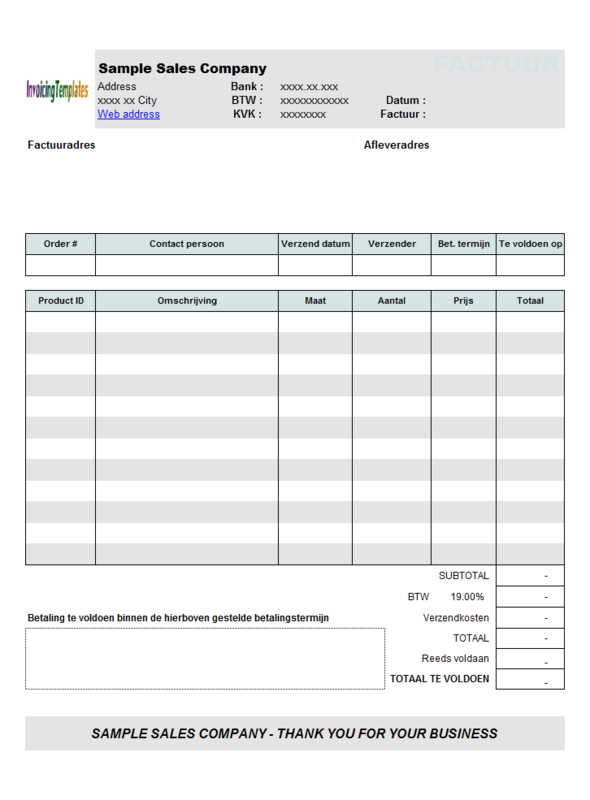 For a service edition of this Netherland VAT Invoicing Sample, please refer to c6012 Netherland Service Bill Format. 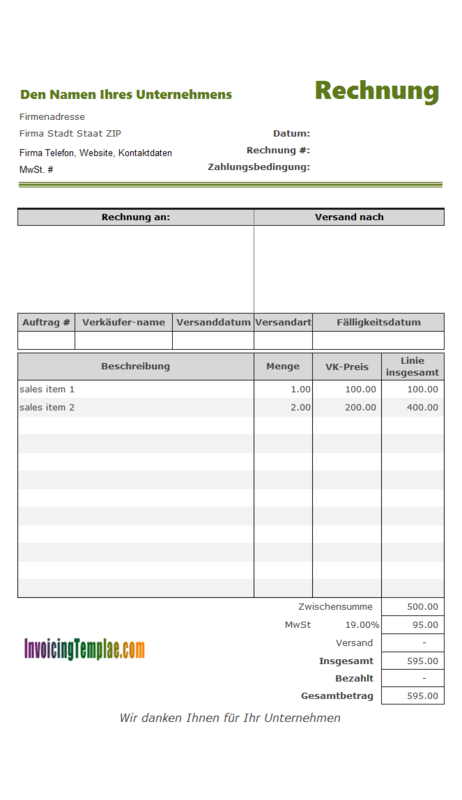 For a version that does not include the "Size" ("Maat") column, refer to c5050 Netherland Sales Invoicing Sample 2 and Netherland Service Bill Template 2. 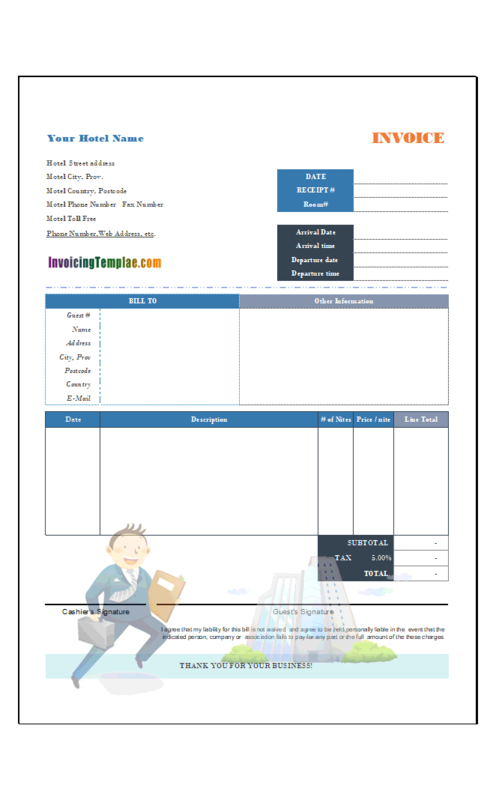 Visit Business Invoice for Netherlands for a version that targets general businesses in the Holland. 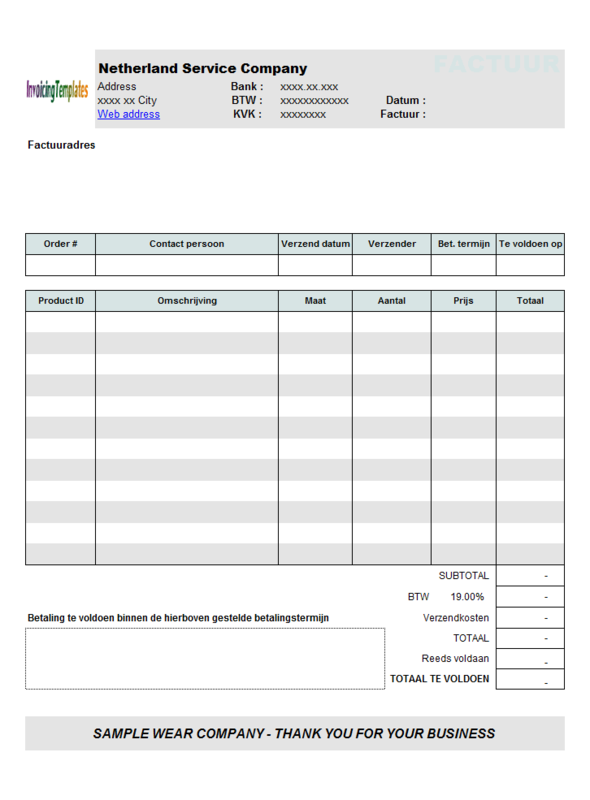 Like other form designs here on InvoicingTemplate.com, Netherlands Sales Billing Form is free (offered to you at a price of 0.00USD). It works on Windows XP and all newer versions of Windows, and Excel 2007, 2010, 2013, 2016 or 2019. Renamed "Customer Statement" to "Aging" report. Replaced default logo image in ActiveX object format with Excel "Picture" object. 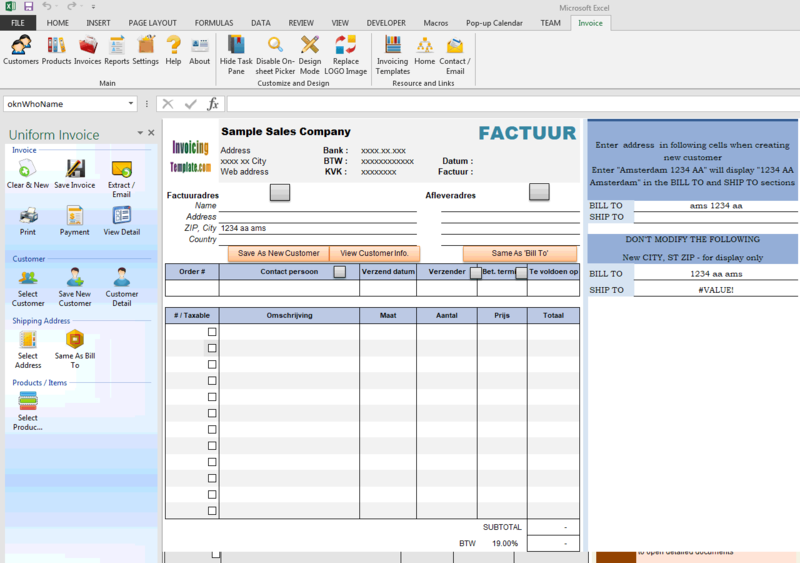 Replaced all ActiveX "Taxable" boxes with Excel form controls. 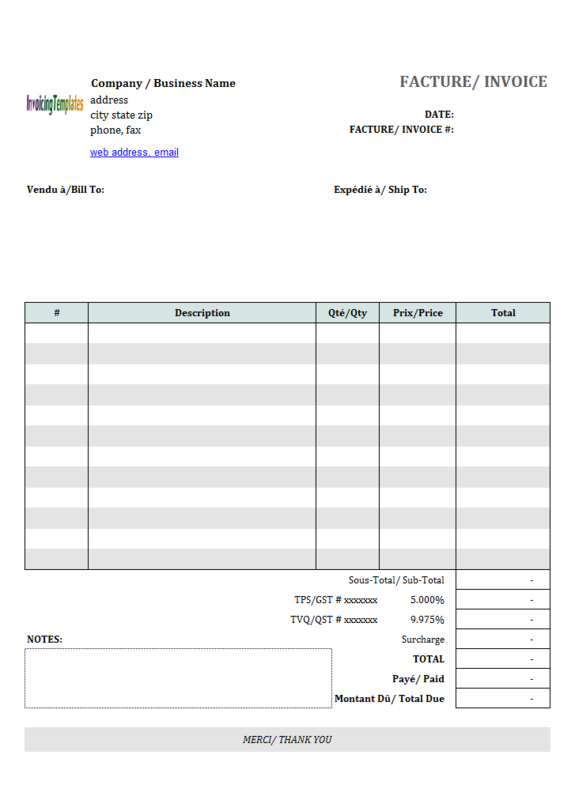 Moved the "Taxable" column into the printable area. Moved the "Pick a product" button column out of the printable area. Replaced all ActiveX label controls in the "Factuuradres" section with Excel cell text. Moved the "ID" in the "Factuuradres" out of the printable area. Support for Excel themed-based color styles. Added "Bottom boder" to all fields inside "Factuuradres" and "Afleveradres".